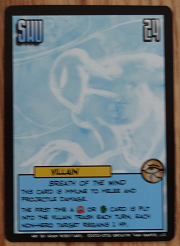 Note: This is Sentinels of the Multiverse’s first attempt at a super villain team. 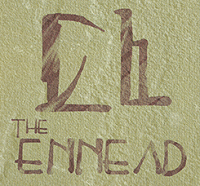 There are nine members in the team overall and they start face-up beneath The Shrine of Ennead. When play begins you put villain cards in play equal to the number of heroes in play. 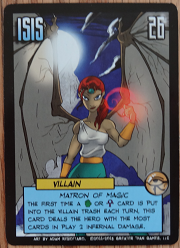 Then, there are cards that put more villains in play. We’ll cover each villain separately. Villain Cards that Begin Game in Play: The Shrine of Ennead: Whenever a villain target would be destroyed, flip it over instead. This card and all cards beneath this card are indestructible and cannot be removed from the play area by any means. How they flip to their other side: When they get reduced to 0 or fewer HP. 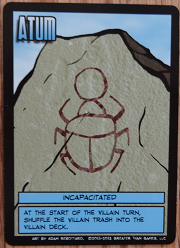 Atum (30 HP): (Active Side) The first time an (ankh symbol) card is put into the villain trash each turn, reveal cards from the top of the villain deck until a (bullseye symbol) card is revealed. Play that card. Shuffle the other revealed cards back into the villain deck. (Incapacited Side) At the start of the villain turn, shuffle the villain trash into the villain deck. 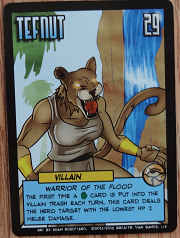 Tefnut (29 HP): (Active Side) The first time a (hand symbol) card is put into the villain trash each turn, this card deals the hero target with the lowest HP 2 melee damage. 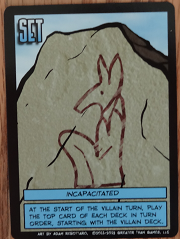 (Incapacited Side) At the start of the villain turn, each player discards 1 card. Shu (24 HP): (Active Side) This card is immune to melee and projectile damage. 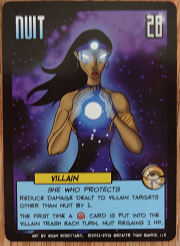 The first time a (bullseye symbol) or (hand symbol) card is put into the villain trash each turn, each non-hero target regains 1 HP. 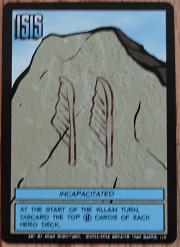 (Incapacited Side) At the start of the villain turn, play the top card of the environment deck. Isis (26 HP): (Active Side) The first time a (hand symbol) or (ankh symbol) card is put into the villain trash each turn, this card deals the hero with the most cards in play 2 infernal damage. 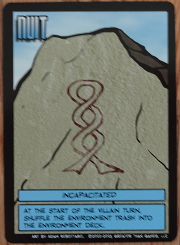 (Incapacited Side) At the start of the villain turn, discard the top (H)—where H = the number of heroes—cards of each hero deck. 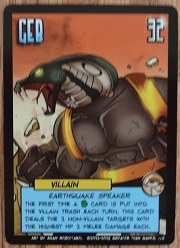 Geb (32 HP): (Active Side) The first time a (hand symbol) card is put into the villain trash each turn, this card deals the 2 non-villain targets with the highest HP 2 melee damage each. (Incapacited Side) At the start of the villain turn, each player puts the top card of their hero deck on the bottom of their hero deck. 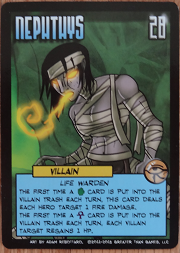 Nephthys (28HP): (Active Side) The first time a (hand symbol) card is put into the villain trash each turn, this card deals each hero target 1 fire damage. 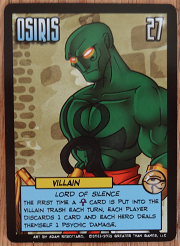 The first time an (ankh symbol) card is put into the villain trash each turn, each villain target regains 1 HP. (Incapacited Side) At the start of the villain turn, each villain target regains 1 HP. 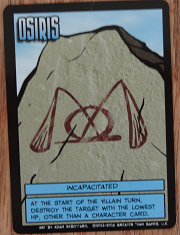 Osiris (27 HP): (Active Side) The first time an (ankh symbol) card is put into the villain trash each turn, each player discards 1 card and each hero deals themselves 1 psychic damage. (Incapacited Side) At the start of the villain turn, destroy the target with the lowest HP, other than a character card. Nuit (28 HP): (Active Side) Reduce damage dealt to villain targets other than Nuit by 1. The first time a (bullseye symbol) card is put into the villain trash each turn, Nuit regains 2 HP. (Incapacited Side) At the start of the villain turn, shuffle the environment trash into the environment deck. 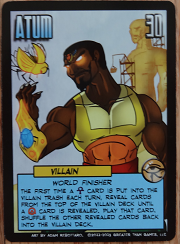 Set (26 HP): (Active Side) The first time a (bullseye symbol) card is put into the villain trash each turn, play the top card of the villain deck. 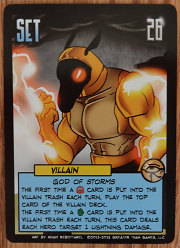 The first time a (hand symbol) card is put into the villain trash each turn, this card deals each hero target 1 lightning damage. 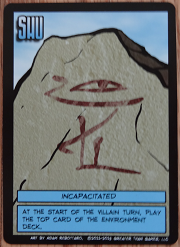 (Incapacited Side) At the start of the villain turn, play the top card of each deck in turn order, starting with the villain deck. 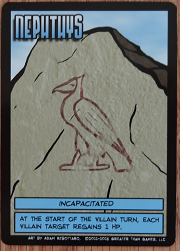 Most Fiendish Ongoing Card: The Shrine of the Ennead: Whenever a villain target would be destroyed, flip it over instead. This card and all cards beneath this card are indestructible and cannot be removed from the play area by any means. 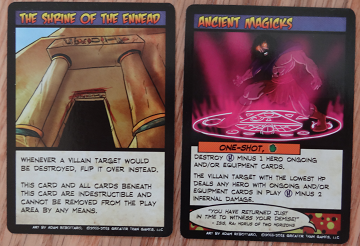 Most Fiendish One-Shot Card: Rise to Power: Move the top card from beneath the Shrine of the Ennead into the villain play area. Play the top card of the villain deck. You will have to fight all nine members of The Ennead unless you have Visionary and a few others like NightMist and Argent Adept who can manipulate the villain deck so it won’t draw into Rise to Power or Taste of Immortality. Both of those cards put a new member of The Ennead into play. Of course if you’re playing advanced mode, you won’t even have this option because a new villain enters the play area at the start of every villain turn, so let’s just say you’ll have to beat all of The Ennead. The key to defeating The Ennead is knowing which villain to take out first. Their active sides can give you a pounding, but don’t fixate too much on that side of their cards. Check out their incapacited abilities, since these abilities will be around longer. 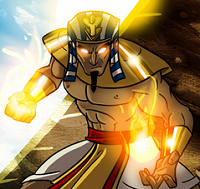 Nephthys, Tefnut, Isis, and Set have some of the most disruptive abilities on their incapacited sides. 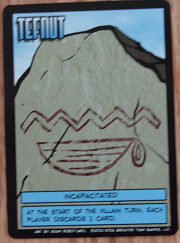 Tefnut has each player discard. That’s not good. Nephthys heals all non-hero targets. You don’t want that either. Isis discards a lot of cards off the top of players’ decks. This can disrupt your flow especially if you know what your next cards are. But Set could go either way. He plays the top card of every deck. This isn’t necessarily bad, but you may want to hold off on him. At any rate, consider taking out Tefnut, Nephthys, Isis, and Set last. Then, there are the villains whose incapacited abilities don’t hurt you that much: Nuit, Geb, and Shu. Shu plays the top card of the environment deck—unless you’re playing a particularly nasty environment, no problem. Geb messes with your hero deck and that can be tricky, but unless you know what’s on the top of your deck, his ability doesn’t hurt you that much. Nuit’s ability doesn’t hurt much either unless you’re playing an environment deck with a lot of targets in it. You’ll want to take out these guys early on, but there’s one villain you should start with if you can. Atum’s incapacited ability can actually help the heroes. He shuffles the villain trash into the villain deck. 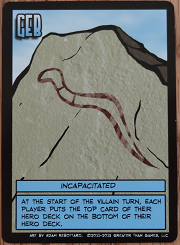 If you don’t already have all The Ennead in play, he makes it less likely that more villain cards will get played. Of course, this is a moot point if you’re playing advanced mode. Still, his ability doesn’t hinder the team. Finally, we come to the last villain Osiris. He would be included in the villains whose incapacited abilities don’t hurt you that much except that he can screw up Unity’s mojo. So long as you don’t have a hero—like Unity—who depends on smaller hero targets staying in play, Osiris isn’t that difficult either and should be taken down early too. This is just a guideline. Every game plays differently, so you may want to study the incapacited abilities of each villain and consider which heroes are in play before targeting.